As part of their 2018 preview, Entertainment Weekly has released the first official image of Aquaman. 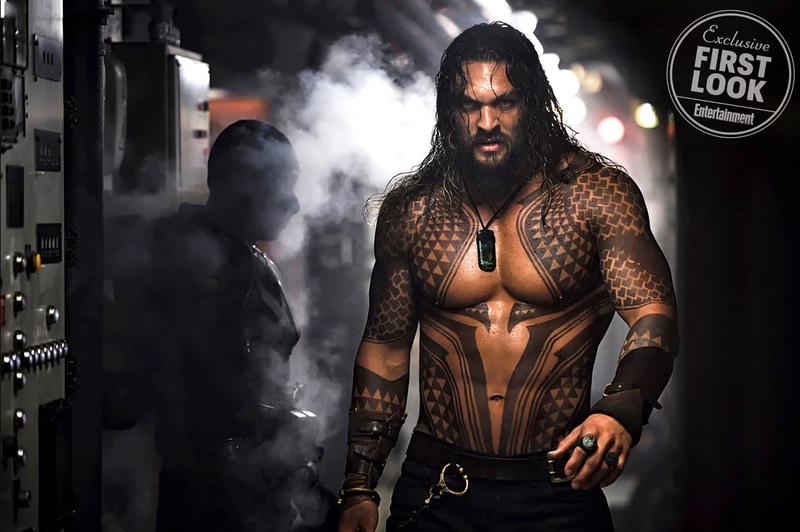 Now that we’ve seen Jason Momoa adventure into the world of DC movies with Justice League, we’re all quite excited to see him swim off in his own solo movie, directed by James Wan. The film is due out in December 2018, and while Zack Snyder and Joss Whedon gave their own take on the (eventual) King of Atlantis, it’ll be Wan’s that gives us the real heartbeat of the character. EW has given us fans a pretty badass new image from the film, featuring an insanely ripped Jason Momoa. While it’s hard to believe, it sure seems like this version of Arthur Curry could spear Khal Drago like a little fish. The look of Momoa is the clear standout, but it’s what’s in the background that’s pretty interesting. Momoa is walking through some mysterious hallway that doesn’t only look industrial, but features some heavy firearm assistance, as we can see a mercenary looking character on the left. This image no doubt amps up the excitement for this solo movie, but the important part here is how exactly this plays into the film. Possible submarine? News broke today that Warner Bros. is adjusting their entire department behind the DC universe, that way we fans get better quality films in the future. But it could be argued that time may be that answer, as Aquaman may be their most promising film to date. Also starring Amber Heard as Mera, Willem DaFoe as Vulko, Patrick Wilson as Orm/Ocean Master, Dolph Lundgren as Nereus and Nicole Kidman as Atlanna, Aquaman swims into theaters on December 21st, 2018.